Manufactuer of LCD Monitor / TV, Plasma TV Mount. 1. Weight capacity: 6kgs each screen. 2. Meets with VESA 75 x 75 and 100 x 100mm. 3. 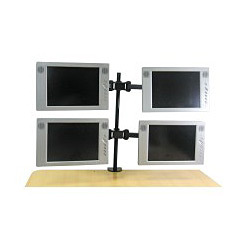 The LCD mounting arm is designed to support 4 screens up to 24" from one pole. 1. The four arms are easy adjustability for swing into any position. 2. With C-Clamp for desktop mounting.